From North to South With "Eaux Plurielles - Multiple Waters", sections will be dedicated to the multiplicity of subjects inspired by water, in or around all waters. You will find various effects of water and atmosphere and elements. 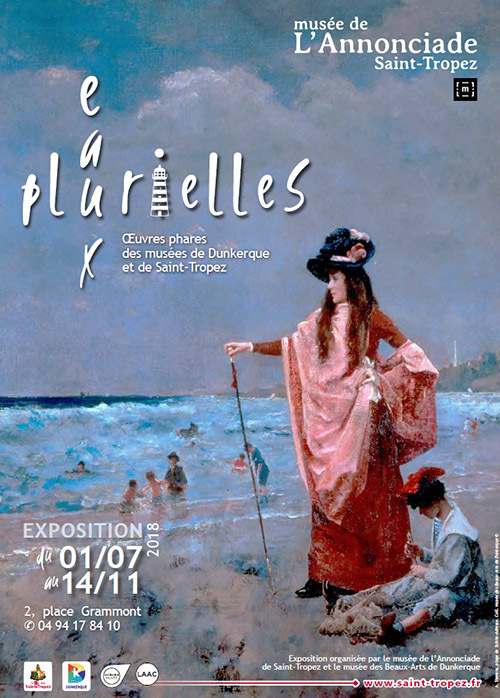 Eighteenth-century painters from the French and North schools of painting will rub shoulders with pointillist painters. Marines will be presented, the port activities of H. Robert to the wild fawn painters to O. Debré, various activities around the salt water including those of the bathing joys (E. Boudin, E. Cross, G. Jaulmes). With so many river banks in imaginary landscapes, lagoons, shores, chromatic effects of the rivers (A. Derain, Sonia Delaunay, The Sidaner, P. Patel ...). Finally, an invitation to distant voyages, beyond the oceans, meets the West and the southern lands around many unusual and exotic objects (fishing instruments of the Solomon Islands, Marquesas, Tonga, Japanese ivories) and a complete transition. found with the route of monumental sculptures presented in town with the creations of Arman. "On the beach of Sainte-Adresse"